How can I list the available color names? I'm trying to add some color to my git configuration and I want to know what color names are available on the terminal. Many online references often talk about color names that are not defined on my system, so I just need a way to see what my default options are. Those probably are defined, but they are X11 colors; once upon a time you could find them in /lib/X11/rgb.txt. In any case, this is a mapping of strings (e.g., dimgray) to 24-bit RGB colors (e.g. 0xff8800 or #ff8800, which would be orange). 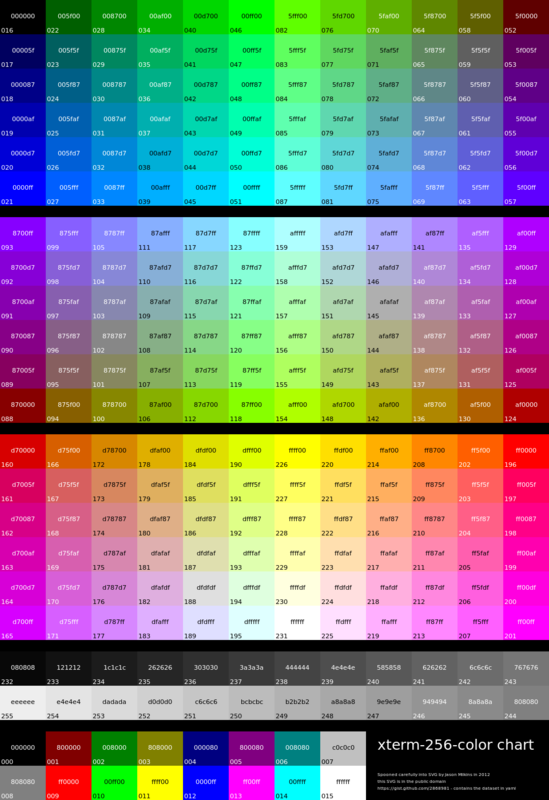 A 24-bit space is ~16 million colors, obviously X11 does not give them all names (CSS 3 uses X11 names, BTW). The 24-bit space is used by your GUI; transparency is implemented by increasing this to a 32-bit space. However, git isn't a GUI (G = graphical) tool, it's a TUI (T = terminal) tool, and it is limited to the colors available on a normal terminal. A little disappointing next to the X11 list, but better than nothing at all! These also have a "bold" or "bright" version that is standard, making 16 colors, which you may be able to specify as, e.g., "brightyellow" (or conversely, "darkyellow"). The index number is in the bottom left corner. Notice the set at the bottom of this chart (0-15) is the 16 basic (bright and dark) ANSI colors. To reference one of these colors under the standard, you use color + the index number, eg. color40. 1. A "GUI terminal" is a terminal emulator that runs in a GUI context, such as xterm, the GNOME terminal, etc. However, this does not make TUI apps (such as git) running in a GUI terminal into GUI apps. They are still TUI apps and are bound by that context. How to add color themes to Gnome-Terminal's GUI preferences? “Friendly” terminal color names in shell scripts?